With only one third of Palestinians satisfied with the Gaza War accomplishments and only one third satisfied with the performance of the reconciliation government, half of Gazans say they are thinking about emigrating and the largest percentage believes that Israel came out a winner in the battle at FIFA. Nonetheless, Ismail Haniyeh and Hamas would win the elections in Gaza Strip while Abbas and Fatah would win in the West Bank. These are the results of the latest poll conducted by the Palestinian Center for Policy and Survey Research (PSR) in the West Bank and the Gaza Strip between 4 and 6 June 2015. The period before the poll witnessed the failure of the reconciliation government efforts to reunify the institutions in the West Bank and the Gaza Strip, a debate among Palestinians over the decision to drop the demand for expelling Israel from FIFA, the formation of a right wing government in Israel under prime minister Netanyahu, the publication of the corruption court decision asserting as unconstitutional Abbas decision to lift the immunity of Mohammad Dahlan and the publication of news reports indicating that Hamas and Israel have indirectly been negotiating a long term ceasefire in the Gaza Strip. This press release covers attitudes regarding Palestinian elections, conditions in the West Bank and the Gaza Strip, reconciliation, the Gaza war, the peace process, FIFA, and other internal and international issues. Total size of the sample is 1200 adults interviewed face to face in 120 randomly selected locations. Margin of error is 3%. Findings of the second quarter of 2015 indicate a high level of frustration among Gazans, with half of the respondents stating that they are considering emigration from the Gaza Strip. This is the highest percentage ever recorded in our polls. Findings also show an additional decline (particularly in the Gaza Strip) in satisfaction with the achievements of the latest Gaza war. Despite this, Hamas does better than Fatah in hypothetical elections in the Gaza Strip and Ismail Haniyeh wins against Abbas in a presidential election in the Strip. In the West Bank Abbas and Fatah are more popular than Haniyeh and Hamas. It is worth mentioning that the public is divided equally on the significance of the electionvictory of Hamas’ student bloc at Birzeit University. Half of the respondents believes that the outcome of this election reflects the trend among the overall public while the other half believes that it reflects the trend among students only. Given the internal dispute within Fatah regarding Mohammad Dahlan, our findings show that his popularity in the Gaza Strip is relatively high, coming in third place after Ismail Haniyeh and Marwan Barghouti in hypothetical elections in which Abbas does not participate. Dahlan’s popularity in the West Bank however is much lower, almost non-existent. In this context, we found that Abbas’ decision to lift Dahlan’s immunity and bring him to trial for corruption finds significant support in the West Bank while opposition to the decision is widespread in the Gaza Strip. Findings show that the public is unhappy with the outcome of the FIFA battle over Israel’s membership. The largest percentage, around one third, believes that Israel came out a winner while a little over a fifth believes that the Palestinian side came out a winner in that battle. Finally, findings show that a slight majority continues to support the two-state solution but that no more than a third believes that a Palestinian state alongside Israel can be established through negotiations. Instead, an overwhelming majority supports submitting a complaint against Israel to the ICC and joining more international organizations. Two thirds believe that a popular non-violent resistance is the most effective means of changing the status quo. In presidential elections, Abbas receives 47% and Haniyeh 46%. Satisfaction with Abbas rises from 40% to 44%. In parliamentary elections, Fatah receives 39%, Hamas 35%, third parties combined 11%, and 16% are undecided. 66% want legislative and presidential elections in few to six months. 47% think that the victory of Hamas’ student bloc at Birzeit University reflects the general trend among the Palestinian public. If new presidential elections are held today and only two candidates were nominated, Mahmoud Abbas and Ismail Haniyeh, the former would receive 47% (compared to 48% three months ago) and the latter 46% (compared to 47% three months ago). In the Gaza Strip, Abbas receives 46% and Haniyeh 50%. In the West Bank, Abbas receives 47% and Haniyeh 44%. Meanwhile, the level of satisfaction with the performance of Abbasrises to 44% (compared to 40% three months ago). Satisfaction with Abbas stood at 50% in June 2014 in the aftermath of the Shati reconciliation declaration but before the Gaza war. Satisfaction with Abbas increases in the West Bank (48%) compared to the Gaza Strip (34%), in villages and towns (59%) compared to refugee camps and cities (39% and 41% respectively), among those whose age is over 50 years (54%) compared to those between 18 and 28 years old (43%), among non-refugees (48%) compared to refugees (38%), among the illiterates (55%) compared to holders of BA degree (41%), andamong supporters of Fatah (77%) compared to supporters of Hamas and third parties (13% and 41% respectively). If presidential elections were between Marwan Barghouti and Haniyeh, the former would receive 58% and the latter would receive 36% of the participants’ votes. Three months ago, Barghouti received 58% and Haniyeh 38%. If presidential elections were between three: Mahmud Abbas, Marwan Barghouti and Ismail Haniyeh, Abbas would receive 25%, Barghouti 38%, and Haniyeh 34%. In an open question, 26% said they prefer to see Marwan Barghouti president after Abbas and 20% said they prefer to see Ismail Haniyeh, 4% said they prefer Dahlan, 3% said they prefer Rami al Hamdallah, another 3% selected Mustapha Barghouti, and 2% said they prefer Khalid Misha’al. If new legislative elections were held today with the participation of all factions, 72% say they would participate in such elections. Of those who would participate, 35% say they would vote for Hamas and 39% say they would vote for Fatah, 11% would vote for all other third parties combined, and 16% are undecided. Three months ago, vote for Hamas stood at 32% and Fatah at 39%. In June 2014, just before the Gaza war, vote for Hamas stood at 32% and Fatah 40%. Vote for Hamas in the Gaza Strip stands in this poll at 39% (compared to 39% three months ago) and for Fatah at 44% (compared to 36% three months ago). In the West Bank vote for Hamas stands at 32% (compared to 27% three months ago) and Fatah at 36% (compared to 41% three months ago). A majority of 66% wants elections to take place within few to six months from today, 10% want them to take place after a year or more, and 21% do not want elections. 47% believe that the outcome of the latest student elections at Birzeit University, in which Hamas’ student bloc won, only reflects the trend among university students, while an identical percentage believes that it reflects a trend among the general public. In explaining the outcome of those elections at Birzeit University, 14% said Fatah’s student bloc lost because Fatah, the movement, lacks credibility and is rife with corruption. 23% said the loss was due to internal disputes within Fatah’s student body or due to its mismanagement of its internal affairs or bad performance inside the university. 12% said it was due to rising Hamas popularity due to the war on Gaza or because the performance of Hamas’ student body was satisfactory. The belief that the outcome of Birzeit elections reflects a trend among the general public is higher in the Gaza Strip (50%) compared to the West Bank (45%), among those between the ages of 18 and 28 (50%) compared to those over 50 years of age (42%), among holders of BA degree (47%) compared to illiterates (31%), among the religious (52%) compared to the somewhat religious and non-religious (45% and 24% respectively), and among supporters of Hamas (78%) compared to supporters of Fatah (26%). Positive evaluation of West Bank conditions stands at 30% and Gaza Strip conditions at 14%; perception of security stands at 54% in the West Bank and 46% in the Gaza Strip. 50% of Gazans and 25% of West Bankers say they seek immigration. Belief that corruption exists in PA institutions stands at 79%. Belief that there is press freedom in the West Bank stands at 23% and belief that there is press freedom in the Gaza Strip stands at 18%. 39% support the decision of the Corruption Court to refuse to try Dahlan for corruption but 46% support the decision of president Abbas to lift his immunity and try him. 84% see ISIS as a radical group that does not represent true Islam and 10% believe it does represent true Islam. Positive evaluation of conditions in the Gaza Strip stands at 14% and positive evaluation of conditions in the West Bank stands at 30%. Perception of safety and security in the Gaza Strip stands at 46%. In the West Bank perception of safety and security stands at 54%. Findings show that the percentage of Gazans who say they seek immigration to other countries stands at 50%; in the West Bank, the percentage stands at 25%. Desire to emigrate is higher in refugee camps and cities (35% each) compared to villages and towns (26%), among those between the ages of 18 and 28 (45%) compared to those over 50 years (13%), among holders of BA degree (41%) compared to illiterates (17%), and among students (52%) compared to merchants and farmers (17% and 18% respectively). Desire to emigrate is specially high among Gazan youth between the ages of 18 and 28 (60%), Gazan students (66%), and among unmarried Gazans (68%). Al Jazeera viewership is the highest, standing at 23%; Al Arabiyya stands at 8%. Viewership of PA’s Palestine TV stands at 20% and Hamas’al Aqsa TV at 12%. Maan-Mix viewership stands at 18%. Perception of corruption in PA institutions stands at 79%. Furthermore, only 23% say there is press freedom in the West Bank and 18% say the same about the status of the press in the Gaza Strip. 32% of the Palestinian public say people in the West Bank can criticize the PA authority in the West Bank without fear. 30% say people in the Gaza Strip can criticize the authorities in Gaza without fear. In light of the recent decision of the Corruption Court to reject the decision of PA president Abbas to lift the immunity of Mohammad Dahlan and to try him for corruption, 39% said they support the court’s decision and 46% said they support the decision of the president to lift the immunity. When asked about the corruption charges against Dahlan, 58% said they thought the charges were true and 19% said they were untrue. 23% said they do not know. Support for the court’s decision is higher in the Gaza Strip (47%) compared to the West Bank (36%), among men (44%) compared to women (35%), among those whose age is over 50 (41%) compared to those whose age is between 18 and 28 (37%), and among supporters of Hamas (45%) compared to supporters of Fatah (33%). An overwhelming majority of 84% believes that ISIS is a radical group that does not represent true Islam and 10% believe it does represent true Islam. 6% are not sure or do not know. In the Gaza Strip, 14% (compared to 8% in the West Bank) say ISIS represents true Islam. Pessimism about the chances for a successful reconciliation continues to rise reaching today 59%; optimism stands at 38%. Satisfaction with the performance of the reconciliation government stands at 35% and dissatisfaction at 59%. 52% believe that Hamas has established a shadow government in the Gaza Strip but only 24% believe that Hamas is responsible for the weak performance of the reconciliation government. More than 70% say that the reconciliation government should pay the salaries of the civil and security sectors that worked for the previous Hamas government. 65% say that the reconciliation government, not Hamas, should be in charge of the security and police sector in the Gaza Strip and 76% support the unification of the police forces in the West Bank and the Gaza Strip under the full command of the reconciliation government. Optimism about the success of reconciliation and the end of the split stands today at 38% and pessimism at 59%. Three months ago optimism stood at 42% and pessimism at 54%.Moreover, satisfaction with the implementation of the reconciliation agreement stands at 31% and dissatisfaction at 65%. Similarly, a year after its establishment, satisfaction with the performance of the reconciliation government stands at 35%; dissatisfaction stands at 59%.Three months ago, satisfaction stood at 28%. It is worth mentioning thata year ago, right after its establishment, 61% had confidence in the reconciliation government. 47% (56% in the Gaza Strip) want to place the reconciliation government in charge of the Rafah crossing, but 36% (26% in the Gaza Strip) prefer to keep it under Hamas’ control. The same applies to the crossings with Israel with 48% (56% in the Gaza Strip) wishing to place them under the control of the reconciliation government. 43% want the reconciliation government to be in charge of the reconstruction of the Gaza Strip and 33% want it placed in the hands of Hamas. 52% believe that Hamas has established a shadow government in the Gaza Strip and 35% reject this claim. But the belief that Hamas was responsible for hindering the functioning of the reconciliation government does not exceed 24% while 32% believe that the PA and president Abbas were to blame for that and 13% blame the head of the reconciliation government. When asked who was responsible for the return of the ministers of the reconciliation government from the Gaza Strip without being able to assume their responsibilities over their ministries, 46% said it was the reconciliation government and the president and 35% said it was Hamas. 75% believe that the reconciliation government should be responsible for paying the salary of the Gazan civil public sector that used to work for the previous Hamas government. A similar percentage (72%) believes that the reconciliation government is also responsible for paying the salary of the Gaza police and security personnel who used to work for the previous Hamas government.65% want the reconciliation government, not Hamas, to be in charge of the Gaza police force and security personnel who used to work for the previous Hamas government; 28% believe Hamas should be the one in charge. 76% support the unification of the police forces in the West Bank and the Gaza Strip, including those who used to work for the previous Hamas government, under the full command and control of the reconciliation government. But 20% prefer to maintain the current status quo in the Gaza Strip, i.e., continued Hamas control of the police in the Gaza Strip. 48% believe the PA has become a burden on the Palestinian people and only 46% believe it is an achievement. A year ago, right after the formation of the reconciliation government, 50% said the PA was an achievement and 45% said it was a burden. The drop in the level of optimism regarding the future of reconciliation is probably one of the reasons for the drop in the belief that the PA is a Palestinian achievement. 63% support Hamas’ indirect negotiations with Israel for a long term hudna. 59% believe that Hamas has won the last Gaza War but satisfaction of the war achievements drops to 35%. 63% support continued rocket launch for Gaza if the siege and blockade continue. 63% support indirect negotiations between Hamas and Israel to reach a long term hudna, or truce, in the Gaza Strip in return for lifting the siege and 32% oppose such negotiations. Support for such negotiations rises in the Gaza Strip (68%) compared to the West Bank (61%), and among supporters of Hamas (74%) compared to supporters of Fatah and third parties (57% each). 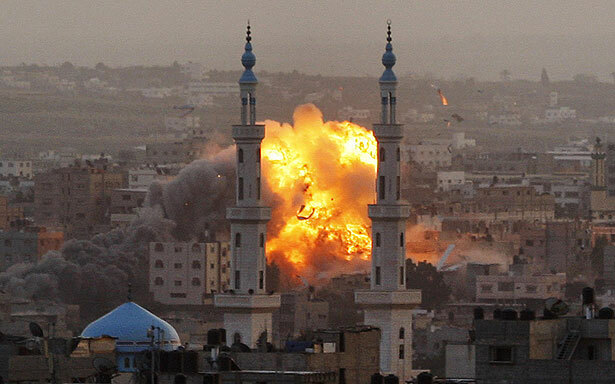 Belief that Hamas has won the Gaza War stands at 59%; 25% believe the two sides were losers. Among Gazans, only 47% say Hamas came out a winner.Nine months ago, 69% of all Palestinians said Hamas came out a winner. By contrast, the percentage of satisfaction with war achievements compared to the human and material losses sustained by the Gaza Strip does not exceed 35% and dissatisfaction at 63%.Despite that, a majority of 63% supports the launching of rockets from the Gaza Strip at Israel if the siege and blockade are not ended. 51% support the two-state solution and 48% oppose it. 34% support the one-state solution and 64% oppose it. 54% oppose and 44% support a mutual recognition of national identity of the states of Israel and Palestine. 86% support submitting a complaint against Israel to the International Criminal Court. 67% support popular non-violent resistance and 49% support return to an armed intifada. Findings show that a slight majority of 51% supports and 48% oppose the two-state solution. A larger majority of 55% believes that this solution is no longer practical due to settlement expansion. Similarly, 72% believe that the chances for establishing a Palestinian state next to the state of Israel in the next five years are slim to non-existent. Despite this, only 34% support, and 64% oppose, a one-state solution in which Arabs and Jews enjoy equal rights. Findings also show that 52% support the Arab Peace Initiative and 44% oppose it. But a majority of 54% opposes a mutual recognition of national identity of Israel as the state for the Jewish people and Palestine as the state for the Palestinian people; 44% support it. Palestinian views on the most effective means of establishing a Palestinian state vary: 36% think that armed action is the most effective, 32% think negotiations is the most effective, and 26% think popular non-violent resistance is the most effective. In the absence of a peace negotiation, 82% support joining more international organizations. 86% support the submission of a complaint against Israel to the International Criminal Court. Moreover, two thirds (67%) support a popular non-violent resistance. A slight majority of 52% opposes, and 46% support, the dissolution of the PA. 51% opposes and 49% support a return to an armed intifada. The percentage of those who are worried that they would be hurt by Israel or that their land would be confiscated or homes demolished stands at 78%. 21% are not worried. Furthermore, an overwhelming majority of 81% believes that Israel’s long term aspiration is to annex the lands occupied in 1967 and expel their population or deny them their rights. When asked about the long term aspiration of the PA and the PLO, 69% said that it is to recover all or parts of the land occupied in 1967 while 23% said it was to conquer the state of Israel or conquer the state of Israel and kill most of the Jews. An overwhelming majority believes that al Haram al Sharif is in grave danger: 50% believe that Israel intends to destroy al Aqsa Mosque and the Dome of the Rock and replace them with a Jewish temple; 18% believe that it intends to divide the plateau on which the two mosques sit so that Jews would have a synagogue alongside the Muslim holy places; and 9% believe that Israel intends to change the status quo prevailing in the plateau since 1967 by allowing Jews to pray there. Only 13% believe that Israel is interested in maintaining the status quo without change. More than half of the public (52%) believes that Israel will indeed succeed in implementing its plans for al Haram al Sharif and 44% believe it will not succeed. 45% believe that the establishment of a Palestinian state is the first most vital Palestinian goal and 30% believe the first goal is to obtain the right of return for the refugees. 29% say that the most serious problem confronting Palestinian society today is the continuation of occupation and an identical percentage says that it is poverty and unemployment. 45% believe that the first most vital Palestinian goal should be to end the Israeli occupation in the areas occupied in 1967 and build a Palestinian state in the West Bank and the Gaza Strip with East Jerusalem as its capital. By contrast, 30% believe the first most vital goal should be to obtain the right of return of refugees to their 1948 towns and villages, 14% believe that it should be to build a pious or moral individual and a religious society that applies all Islamic teachings, and 11% believe that the first and most vital goal should be to establish a democratic political system that respects freedoms and rights of Palestinians.The most serious problem confronting Palestinian society today is the continuation of the occupation and settlement activities in the eyes of 29% of the pubic; an identical percentage believes it is poverty and unemployment. 22% say it is the spread of corruption in some public institutions; and 15% believe it is the siege of the Gaza Strip and the closure of its crossings. Israel won more than the Palestinians in the FIFA battle. An overwhelming majority supports the campaign to boycott Israel. After the formation of right wing government in Israel, 79% are pessimistic about the future of Israeli-Palestinian relations. The nuclear deal with Iran is good for Israel but bad for the Arabs. FIFA: in the FIFA battle over Israeli membership in the international football federation, 33% believe that Israel came out as the winner and 22% believe the Palestinian side came out as the winner. 10% believe both sides were winners, 4% believe both sides were losers, 15% believe neither side won or lost, and 17% did not know or did not express an opinion. Boycott of Israeli products: 86% support the campaign to boycott Israel and impose sanctions on it and 88% say they have stopped buying Israeli products, such as those manufactured by Tnuva or Strauss, and 64% believe that the boycott of Israeli products will be effective in helping to end the Israeli occupation. Israeli right wing government: in the wake of the formation of a new right wing government led by Prime Minister Netanyahu, 79% of the public feel pessimistic about the future of Palestinian-Israeli relations. Nuclear agreement with Iran: 36% of the public believe that the framework agreement on Iran’s nuclear program, signed between the US and Iran, is a bad agreement for the Arabs and 25% believe it is a good agreement for the Arabs. 25% believe it is neither good nor bad. When asked if the agreement is good or bad for Israel, 50% said it was good and 24% said it was bad; 12% said it was neither good nor bad.